It’s a marked contrast walking from the July sunlight outside to the dark basement of Joshua Brooks’, and it’s a contrast only heightened by the claustrophobic conditions endured by the three characters being held hostage in Someone Who’ll Watch Over Me. 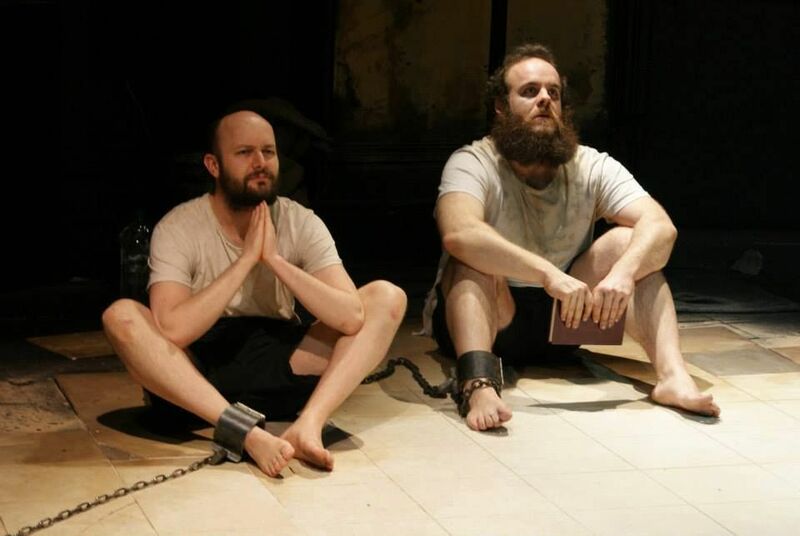 Meeting American Adam (Alastair Gillies) and Irishman Edward (Richard Patterson), we’re introduced to their world: a cell, some chains and each other. It’s not long before prissy English professor Michael (Karl Seth) is added to the mix, and the three find they can only rely on their imaginations and each other to prevent themselves going mad. Passing the time trading insults about their nationalities, they often slip into gallows humour to cope with the unbearable situation as their (unseen) Arab captors taunt and watch them. It seems churlish to say that a play about a hostage situation is funny but there are many opportunities for laughter, most of them unexpected. It is testament to the performances of the actors that the audience is unsure whether to laugh, or feel discomfort, at the slapstick action unfolding on stage. And it is this examination of the human condition, and how we cope under extreme pressure that has madeSomeone Who’ll Watch Over Me endure over the last twenty years. The daily grind of not knowing whether as a hostage you’ll live or die, combined with a spotlight on the political differences between the three nations, makes for a compelling watch. Someone Who’ll Watch Over Me is a difficult play to get wrong and unsurprisingly, this is a fine performance. Frank McGuinness’ text jumps off the page, and the trio of cast members leap at the chance to get their teeth into it. Patterson (MTA nominated for ‘The Best’) in particular excels as Edward, his mood wavering from hope to despair as his cheeky chappy persona gives way. Gillies provides a dark insight into Adam, in particular when the character begins to break at the end of Act One. It’s a confident, assured and compellingly disturbing performance as Adam’s pacifying nature snaps under the weight of his own internal madness. Seth completes the trio as the stuffy professor, but Seth is able to give at good as he gets turning from victim to man of steel as he invents games and fantasies to cope with his incarceration. All three leads work well together, and it is a shame to see Gillies leave the action part way through the second half, such is the power of all three actors. The changes of pace from hilarity to darkness are masterfully handled by director Colin Connor, who together with his tight cast maintain audience engagement and keep events moving. Meriel Pym’s sensibly sparse set design means emphasis can be placed on the physical and emotional chains holding the men together. Benedict Almond’s sound design amplifies the isolation of the men in their captivity whilst Peter M. George’s lighting is effectively executed, intensifying or subduing the action according to the state of play. Someone Who’ll Watch Over Me is a reminder of the triumph of humanity, and this version is more relevant than ever as the play enters its twentieth year. The script shines thanks to the performers, and this tale of human despair, hope and above all humour, still remains an irresistible pull. Image by Shay Rowan. Originally published on The Good Review.